Let’s have a refreshing drink. And no, not one with booze. Instead, one that includes fruit which I caramelized in brown sugar and coconut oil and butter and then pureed the heck out of in the blender. That seems like a lot of work for a blended snack. Twenty minutes for a drink? Eh? By the way, that’s what this is – a snack. Or I guess a meal. I will tell you right now that it’s certainly not dessert in my book. Fruit and yogurt? Definitely snack. Or breakfast! Wait. Yes yes. Breakfast too. Last year I jumped on the lassi bandwagon, if you can call it that. I was all about the cantaloupe lassi but… it’s certainly been replaced by this. And it’s quite possible that I have trashed up the lassi as much as one humanly can without adding chocolate or bacon. Perhaps I should have dyed my lassi blue in honor of the royal baby. Perhaps I should have a royal baby of my own so my hair and legs can look as amazing as Kate Middleton’s 24 hours after birth. I think that must be the secret. Royal baby. Even though this is just a simple smoothie, the flavors are so complex. At least for this little palette of mine. There is obviously sweetness but also some spice from the cardamom, which I adore. If you’re not a cardamom fan, add a little cinnamon. If you’re not a cinnamon fan, leave it out. If you don’t want to use yogurt, use ice cream. See where this is going? Make it your own. I usually feel like a jerk posting a “recipe” for a shake, especially when it’s not a cocktail, but this.is.so.tasty. I know. You probably hate that word. You gotta be a fruit freak like I am though to love this. Seriously. <—– fruit freak. Heat a large skillet over medium-high heat and add coconut oil and butter. Once melted, add in 4 pineapple rings and sprinkle brown sugar and salt over top. Cook until golden brown and caramely on both sides, about 5 minutes per side. Remove and let cool slightly. Combine caramelized pineapple, coconut milk, yogurt, cardamom and cinnamon in a blender and puree until smooth. Pour into glasses and sprinkle a tiny bit of cardamom on top. Cut the remaining pineapple slice in half and add it to the top of the shake. Serve. Oh oh oh you could also cinnamon-sugar the rim. Yes. Do that. 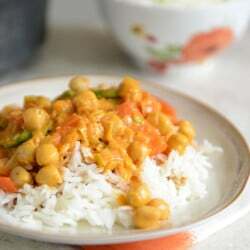 Easy Thai Chickpea Curry with Coconut Rice. Hi! I could have sworn I’ve visited this site before but after going through many of the articles I realized it’s new to me. Nonetheless, I’m certainly happy I found it and I’ll be bookmarking it and checking back regularly! This sounds delicious! I could totally get down with this for breakfast. Very imaginative tasty twist to traditional Indian drink, Lassi! But, it would have been helpful to know what will be the Carb, Protein, Fat etc % breakdown in one serving thus made.